The Maldives has a long and rich heritage of arts and crafts and the country is home to some of the most skilled craftsmen in the world. Ancient traditions have been passed from generation to generation and the arts and crafts made today are a testament to these age-old skills. Arts and crafts of the Maldives are created using mostly raw materials that are easily available such as palm leaves, reeds, coral, wood, shells, stones, coir, natural oils, and paints, and traditional Maldivian crafts include liyelaa jehun (lacquer work), mat weaving, boat building, coir-rope making, and fangi vinun (thatch-weaving). Though performances of traditional music and dance are not everyday events, there is a contemporary Divehi culture which is robust and adaptive, despite foreign influences which range from Hindi movies and Oriental martial arts to Michael Jackson and Muslim fundamentalism. Western fashions, pop music, and videos are highly visible, but on public occasions and festivals, like the beginning and end of Ramadan, the celebrations always have a distinctly Maldivian touch. There are three daily newspapers and several magazines in the unique national language, rock bands singing Divehi lyrics and multi-story building which echo traditional village houses. Its remarkable for such a tiny population to maintain a distinctive and living culture. A bodu beru means a big drum and gives its name to the best-known form of traditional music and dance. It is what tourist resorts put on for a local culture night, and it can be quite sophisticated and compelling. Dancers begin with a slow, calm swaying and swinging of the arms, and become more animated as the tempo increases, finishing in a rhythmic frenzy. In some versions, the dancers enter a trance-like state. There are four to six drummers in an ensemble, and the sound has strong African influences. Contemporary local rock bands often perform at resorts where they do credible covers of the usual old favorites. Performing for a local audience, they may incorporate elements of bodu beru in their music, with lots of percussion and extended drum solos. Two bands popular with locals is Mezzo and Zero Degree, both of which can be found in most music shops. Many of the resorts will offer DJs who can provide a personal touch to the playlist. They often read the crowd and adapt the music they play based on how people are responding and the vibe. One of the top DJs in the Maldives is Aminath Fazleena Abbas. While some resorts jet in DJs from around the world, “Angie” (as she has been classed since a young age) hails from her hometown of Male. She might just be the top female DJ in the Maldives (DJing has been a bit of a male dominated domain as only 2 of DJ Mag’s Top 100 DJ acts are women. And curiously, both acts are duos). Despite a unique script which dates from the 1600s, most of the Maldivian myths and stories are mostly from an oral tradition and have only recently started to appear in print. Many are stories of witchcraft and sorcery, while others are cautionary tales about the evils of vanity, lust, and greed, and the sticky fates of those who transgressed. Some are decidedly weird and depressing and don’t make for good bedtime reading for young children. 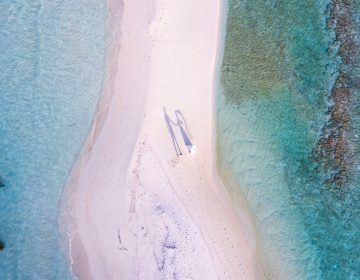 Novelty Press has published a small book called Mysticism in the Maldives, which is widely available, and a series of booklets called the Finiashi – heard in the islands, most of which are out of print, but possibly obtainable from the Malé libraries. A traditional Maldivian village is notable for its neat and orderly layout, with broad streets in a regular, rectangular grid. Houses are made of coral-stone joined with mortar, and the walls line the sides of the roads. Many homes will have a shaded courtyard in front, enclosed by a chest-height coral wall fronting the street. This courtyard is an outdoor room, with Joli seats and undholi, where family sit in the heat of the day or the cool of the evening. A more private courtyard behind the gifili, has a well and serves as an open-air bathroom. At intersections, the coral walls have rounded corners which considerably soften the street scape. These corners are seemingly designed to facilitate turning vehicles, but they are like this in small villages which have never seen a car. 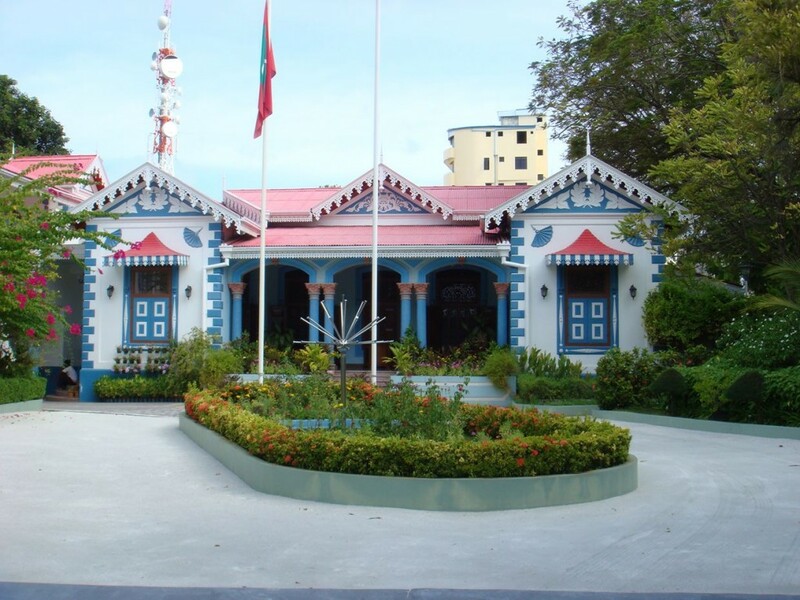 The same style is used in Malé, where it does make turning easier for cars and trucks, but it is also a feature of big, modern buildings, and appears to be a deliberate adaptation of a traditional element. On other structures, like the president’s palace and the police headquarters, the rounded design may derive more from fortress design, especially as they have circular sentry posts on the corners. The architecture of resorts is more eclectic, imitative of anything from a Balinese bale to an African rondavel. Some have a natural style, with thatched roof buildings which blend unobtrusively into the landscape, but many modern resorts have tiled roofs and stark white walls and look more like suburban motel blocks than tropical hideaways. The only part of a tourist resort with any identifiable Maldivian character is the open-air bathroom, a delightful feature which is popular with guests. There’s no tradition of painting, however, local artists have been painting and producing creating paintings, drawings, mixed media, and experimenting with multiple forms of visual arts techniques for decades. Artists such as Mariyam Shany Ahmed, (more commonly known as “Manje”) (below) is a self taught mixed media artist, mostly working with watercolors, acrylics and inks. Her works tap into the relationships between nature, feminine beauty and folklore, often featuring pensive portraits of women surrounded by lush flora, fauna and underwater creatures; awash in vibrant colors and elaborate details. Follow Shany Ahmed at https://www.instagram.com/tiggmanje/?hl=en and www.facebook.com/art.manje. Other very skilled and well known painters include Ahmed Abbas, Eagan Badeeu and Afu – Afzal Shafiu Hassan. 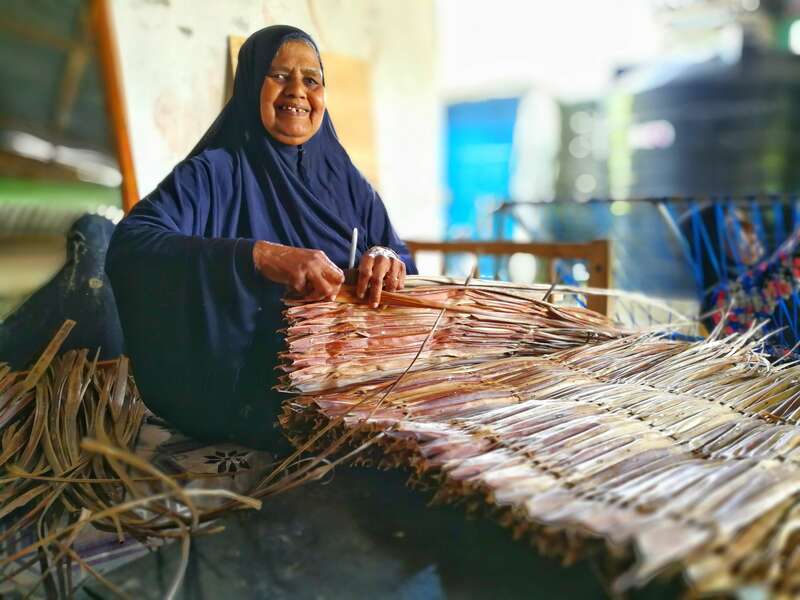 Different islands have historically specialized in various crafts, like the silversmiths of Rinbudhoo Island, the lacquer workers of Eydafushi or the weavers of Gaddhoo. This might relate to the availability of certain materials, like the special reeds and grasses used for weaving mats, but mainly it seems to be a matter of tradition. 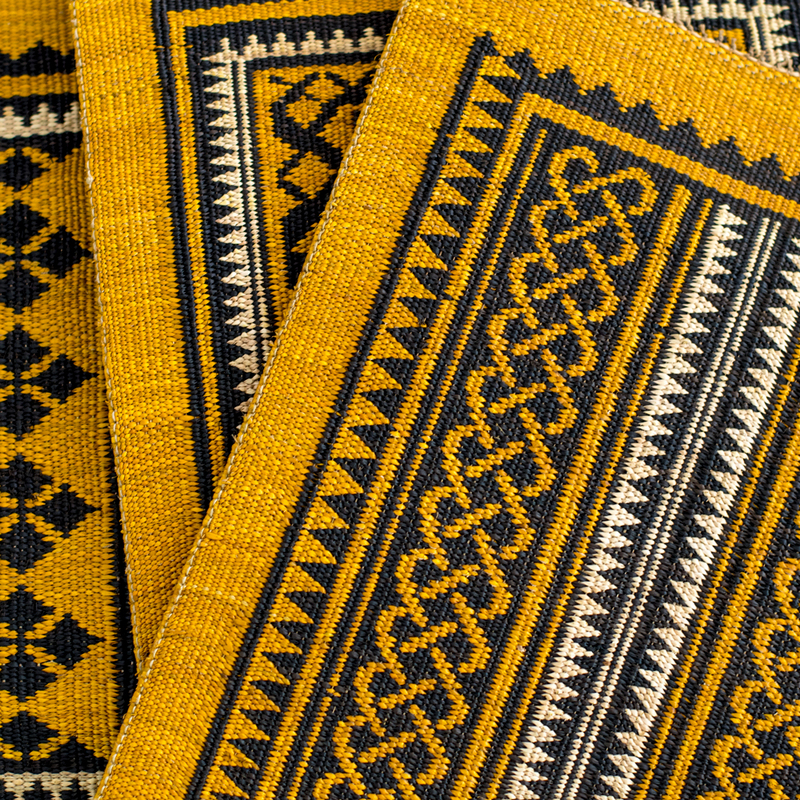 The beautiful woven mats known as kunaa are made only in Gaaf Dhaal, but it seems to be a dying art. A Danish researcher in the 1970s documented the weaving technique and the plants used for fibers and dyes and noted that some traditional designs had not been woven for 20 years. Collecting the materials and weaving a mat can take weeks and the money that can be made selling the work is not much by modern Maldivian standards. The prospects of this superb craft being revived by tourist demand seem remote, especially as tourists cannot go to the source, see the work being done or buy directly from the artisans. Many types of wood are used to make boxes, bowls, vases, and other turned objects. Traditionally the lathe is hand-powered by a cord pulled around a spindle, though electric motors will no doubt replace that method soon. Several layers of lacquer are applied in different colors and allowed to harden; then the design is incised with sharp tools, exposing the bright colors of the underlying layers. Designs are usually floral motifs in red, yellow and green, with a background of black. The patterns are a little abstract and do not typically resemble native Maldivian flora but may be based on designs seen in Chinese ceramics. 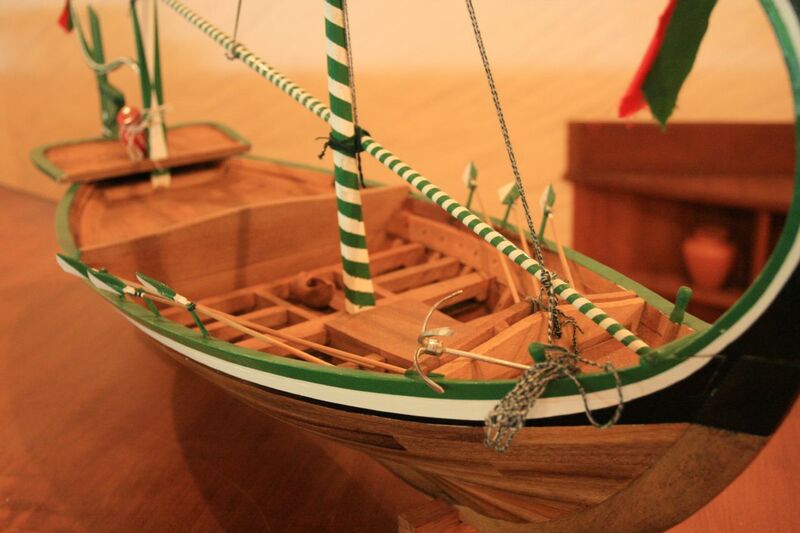 Traditionally, lacquer work was for containers, bowls, and trays used to present gifts to the sultan, and some excellent examples can be seen in the National Museum in Malé. 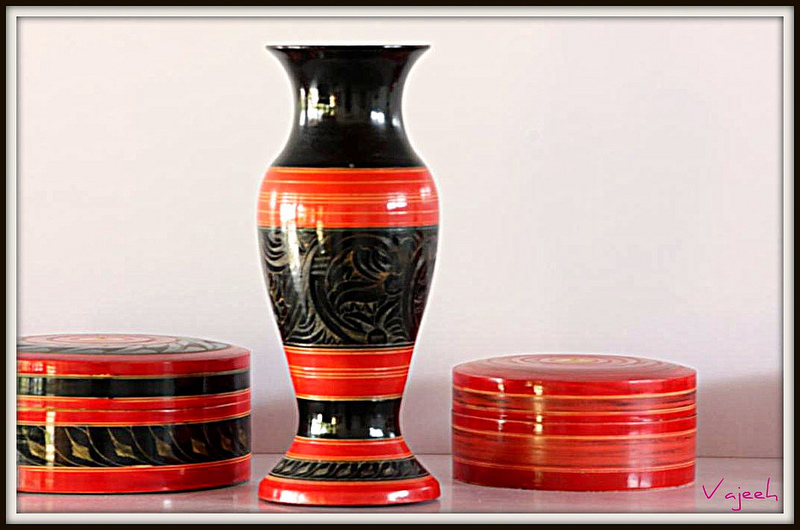 Vases and small boxes are the most common lacquer work items in tourist shops, and the designs follow traditional colors and styles, though the objects themselves are a response to tourist demand. Production of lacquer work seems to be a viable cottage industry and is concentrated in Baa, particularly the island of Thulhaadhoo. 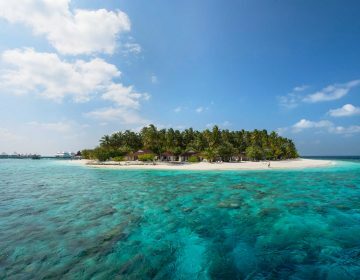 Rinbudhoo Island in Dhaalu (South Nilandu Atoll) is famous for making gold jewelry, and Huludeli, in the same atoll, for silver jewelry. 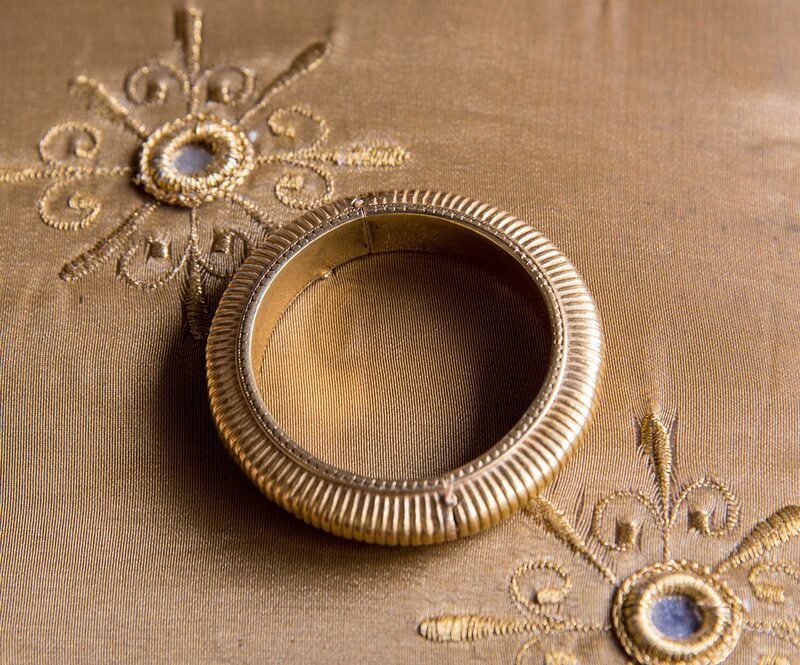 According to local belief, a royal jeweler brought the gold-smithing skills to the island centuries ago when he was banished to Rinbudhoo by a sultan. It’s also said that the islanders plundered a shipwreck in the 1700s and reworked the gold jewelry they found to disguise its origins. The art of coir rope making in the Maldives is regarded as one of the country’s traditional handicrafts and a unique art form that has been passed down from generation to generation. Known as ‘roanu veshun’ in the local Dhivehi language, coir rope making has long been an integral part of the Maldivian lifestyle, being used for the construction of traditional boats (dhonis) and houses, and hammocks or joali. It is usually the women of the community that are mostly involved in roanu veshun or coir rope making, using different parts of the abundant coconut palm to produce items for their daily needs. Eagan Badeeu and Afu – Afzal Shafiu Hassan. Thanks for the feedback – I have edited accordingly. Many thanks and I have changed the article accordingly. 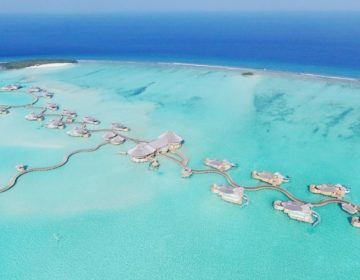 I note that this article was published in 2018 and this is a blog targeting tourists coming to the Maldives. As a Maldivian artist I am compelled to write this as I think that this article isn’t representative of what the Maldivian ‘Arts and Crafts’ is about right now. It is also perpetuating a misconception about Maldives and an ignorance about the Maldivian people. First of all, It would be great if you would credit the artists / photographers who’s images and artwork you have featured in this article, and perhaps even link their pages along with that. While you are correct in saying Maldivians don’t have a tradition of painting – it is true only in comparison to the western history. 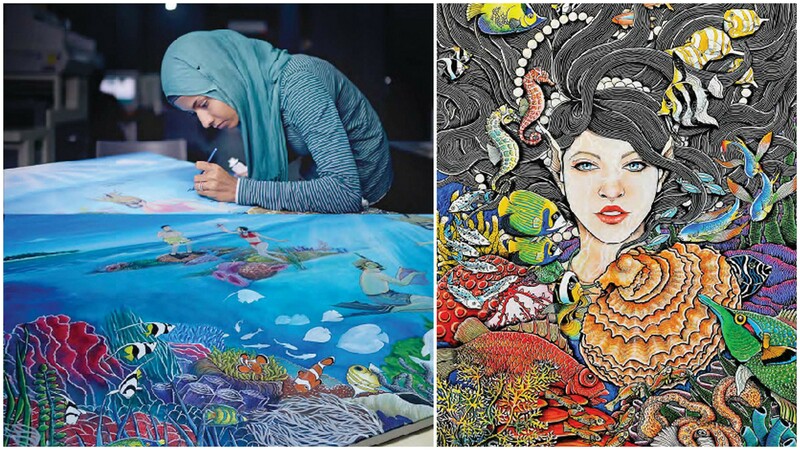 There are many Maldivian artists who paint – for example Shany Ahmed who’s images you have used in your article (her insta https://www.instagram.com/tiggmanje/?hl=en). Other very skilled and well known painters include Ahmed Abbas, Eagan Badeeu and Afu – Afzal Shafiu Hassan (look them up). They’ve been painting for decades. There’s many more who are creating paintings, drawings, mixed media, and experimenting with multiple forms of visual arts techniques. It’s true that most tourists don’t see much Maldivian art. That’s because most local artists and crafts people are too often overlooked by the resorts and souvenir shops favour of western artists or cheap imitations of souvenir art from other countries. 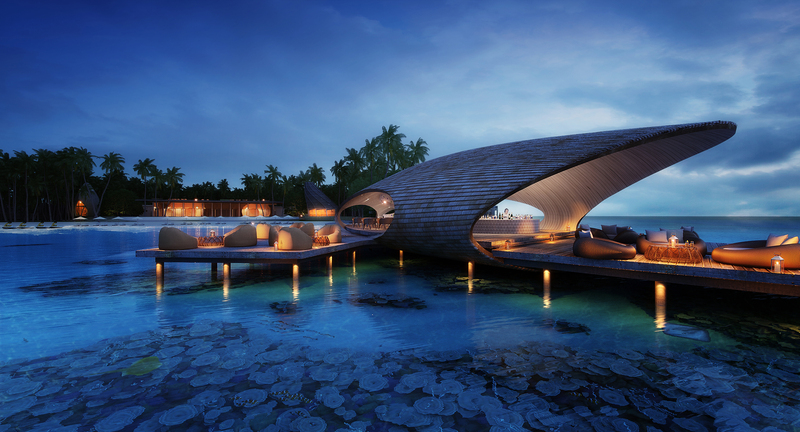 There are however some resorts that are trying to show Maldivian art – e.g. Kadinma. The resorts also often (but not often enough) invite Maldivian DJs and musicians for entertainment. Maldivians create and perform many genres of music beyond the traditional boduberu. Our musicians have traveled overseas to perform in global music festivals (e.g. https://soundcloud.com/ommega). Also look up Autonomotor https://soundcloud.com/autonomotor and https://www.facebook.com/fathu/ – just two examples. we’ve even had “Maldivian Idol”! It would be very helpful for us locals, especially local artists if journalists, writers, bloggers and booking websites such as this did some more research about what’s actually happening contemporary Maldives, rather than skimming over somewhat outdated ‘facts’ about our country. If you can’t find published literature, then reach out via the internet to many of us who are online and identify ourselves as Maldivian musician or artist. We aren’t just a bunch of island people stuck in a tropical tourist fantasy. We are an evolving, vibrant and creative culture of people very much in tune with the rest of the world. Thank you for your feedback and comments – much appreciated. I have edited the article as suggested and hope this is a better representation of the local contemporary artists.